To respond to the Do Now U, you can comment below or post your response on Twitter. Just be sure to include #DoNowUHealth and @KQEDedspace in your posts. Since 1986, Jimmy Carter has worked to eradicate the guinea worm. From an initial 3.5 million cases to only 126 in 2014, the Carter Center has nearly succeeded in making guinea worm the second disease in human history, after smallpox, to be eradicated. However, Carter has been the only one pushing for the eradication of this disease. Organizations such as UNICEF and the World Health Organization (WHO) have aided in approving measures, but have not monetarily contributed to the program. For decades, philanthropic health intervention has supported governments in areas struggling to cope with diseased populations. Global health initiatives have largely become reliant on a handful of well-wishers like Jimmy Carter because of how difficult it is for governments and international organizations alike to raise funds for humanitarian ventures. The weighing of economic burdens against health burdens has raised an important question: who should be fiscally responsible for maintaining the health of humanity? With campaigns such as the Carter Center’s guinea worm eradication plan and the Bill & Melinda Gates Foundation’s tuberculosis incidence reduction program, efforts made by philanthropic organizations are playing a major role in solving the world’s health issues. By focusing on and devoting large sums of money to specific projects, these organizations have been effective in many respects. However, those who are responsible for deciding which health programs should receive funding and which ones have to wait are faced with overwhelming ethical questions, and are often themselves unaffected by the health issues at hand. Moreover, philanthropic organizations operate out of their own good will. Because of this, it might not be feasible to rely on them to continue paying for the world’s health without an effective and reliable system in place. A Cambodian boy receives the measles vaccine. International humanitarian organizations, most notably WHO, work side-by-side with philanthropic organizations. WHO supports countries to improve health technologies, strengthen health information systems and assure that all people have access to health services at an affordable price. The World Bank, a similar United Nations institution, provides policy advice to help countries expand access to affordable health care, protect people from poverty caused by illness and promote investments that support humanitarian advancement. Although these entities provide coordinating authority in health and set global agendas for achieving universal wellness, they are severely underfunded and often rely on private philanthropic organizations to initiate global health projects. This situation raises the question of whether or not international humanitarian organizations like WHO should receive more funding from Western nations. Even so, there are many concerns surrounding a single international organization having the power to set and police the global health agenda for the entire world. There are also ethical concerns regarding the potential for Western countries with greater monetary influence to manipulate an international organization into a surrogate for their own health ventures. On a national level, governments are important in global health because they have direct influence over their populations and are directly impacted by the health of their people. Every nation desires a healthier population, but some countries cannot provide adequate health care to their citizens because of their limited resources and debilitated economies. Consequently, when local governments have to direct more money to health, they contribute less to other public necessities like sanitation, education, and infrastructure. This makes aid from developed countries the backbone of health-care sectors in developing countries. The United States, for example, has led successful efforts in combatting the AIDS virus on a global scale through a government-sponsored program known as PEPFAR. However, in the developed world, political controversy stems from the idea that local governments will eventually enjoy the benefits of a healthier population and should therefore handle their own health care regardless of limitations on resources. Additionally, party polarization over foreign aid as a component of the U.S. budget has the potential to cut western aid to the developing world, thus threatening the reliability of American dollars for health measures whenever political leadership changes. As Carter’s guinea worm eradication project nears completion, other health-care issues around the world continue to pose major economic, biological, and ethical dilemmas for many developing nations. What do you think? Who should be responsible for funding global health initiatives? 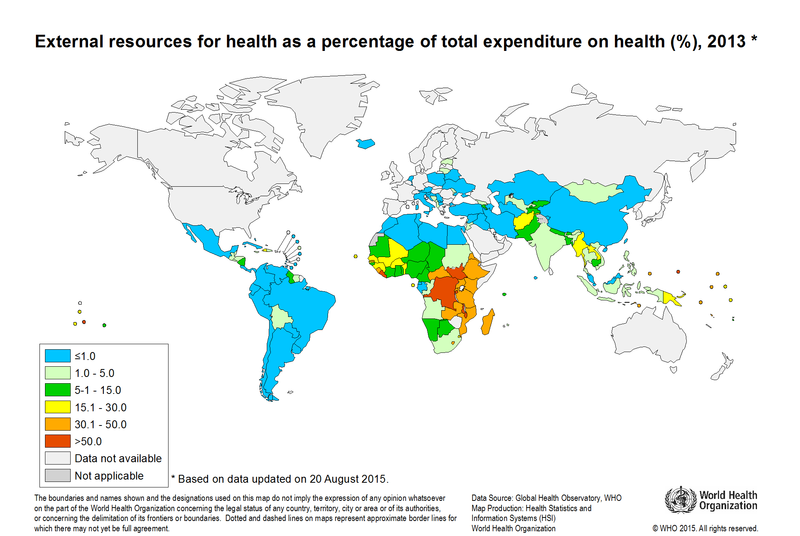 This map shows the reliance of developing countries on external resources to support their health systems. This site shows how $1.73 billion in United States Government financial investments is managed by the CDC to improve global health (2013). This interactive website provides many different metrics for public and external funding for health initiatives in developing countries. This post was written by the following students at Duke University: Ajay Desai, Kerry Mallinson, Shivani Purohit, Murotiwamambo Mudziviri and Victoria Coaxum. attention to global health initiatives. support and make issues better with our resources and tools. Since it is in the interest of all nations to maintain human health, in order to avoid global pandemics, developed nations should lead the fight. The W.H.O and the United Nations have a moral obligation to help their fellow man. Obviously, the richer nations of Earth, have a greater economic ability to contribute to world health. The question always falls to an economic one. With the popular refrain of “with what money”? Well the answer is an obvious one, the United States for example, spends more on defense than any other nation on Earth. We could prioritize saving human lives over bombing people in the middle east. The largest issue with this would be Americans demanding that the money be spent domestically rather than internationally. But that would be a separate discussion. In any case, the Cold War is over, and the industrialized nations of the world should cut back on their war machines, and actually use that money for the good of the human race. I think that the pressure in being responsible for funding global health lies with developed countries. For the most part, those countries that are impacted the most by disease are the ones with a poor economy, who have little resources to combat those diseases. We are all human and deserve the same rights no matter where we live and the status of our countries economy. In that sense, because of the moral obligation to help one another, the WHO should be mainly funded by developed countries. But I think its important to take a step further and look at who specifically in the developed countries should be funding the global health initiative. Obviously the aid will come from the government, however the media within the developed countries can play a big role in gathering donations from the population of the developed countries. Educating people in what is going on in the world is key to helping those countries get the treatment they deserve. If the media were to have more news stories or investigations pertaining to diseases then people will be more inclined to want to help out those in need, thus more funds will be flowing to organizations like the WHO. I believe that every nation should contribute to global healthcare somehow, however wealthier nations owe it to the rest of the world to contribute more of their funds to this cause. It is incredible yet sad that there are some communicable diseases that only exist in countries that can’t afford to fund initiatives to end them. Just because global populations are separated by oceans, landscapes and country borders does not give those with more westernized medicine the right to ignore the populations who are underdeveloped and severely struggling. Countries who are struggling, however must recognize that their contribution and support is just as important. Needs assessments are also extremely important when discussing funding. Countries around the world all have very different healthcare needs and this will determine how much and where funding will go to. Health initiatives have a more significant impact with a grassroots approach rather than a top down approach. Cultural competency is extremely important when it comes to healthcare and when funding stems from local governments, locals may be more likely to get involved with these initiatives. This in turn may cause a more significant impact with implementing global healthcare.